From time to time, an IIS Application Pool may need to be recycled. This can be used to reset any connections, such as cached B1WebAPI queries or Portal user logins. In IIS, right-click on the website (see marker 1 below) and open Manage Web Site > Advanced Settings… (see marker 2 below). 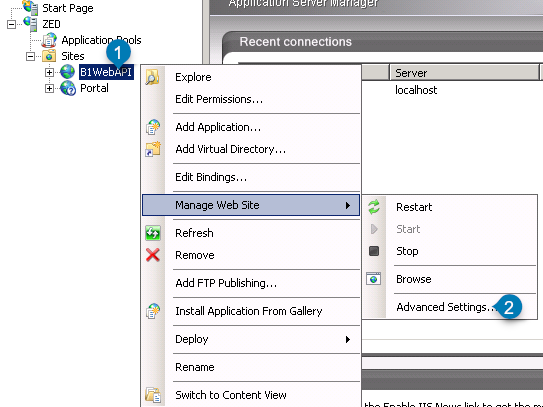 Right-click on the website in IIS (1) and open Manage Web Site - Advanced Settings (2). In the Application Pool field (see marker 1 below) identify the Application Pool assigned to the website. This is the Application Pool that will need to be recycled. Identify the Application Pool assigned to the website (1). In IIS, open the Application Pools screen (see marker 1 below) and right-click on the Application Pool (see marker 2 below) which was identified in the previous step. 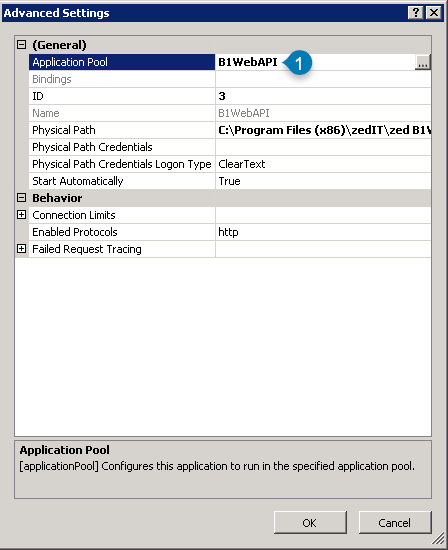 In Application Pools (1), right-click the previously identified Application Pool (2). From the menu, choose “Recycle” (not “Recycling…”) (see marker 1 below) to recycle the website’s Application Pool. This will reset any active connections to the website, which will force users to log back in with their username and password. 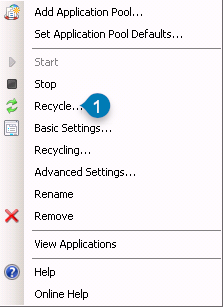 Press Recycle (1) to recycle the website's application pool.